The home front has become a battlefield for many military members fighting the war on terror. After protecting and serving a country they love, military members return home only to continue their battle by trying to heal the physical and mental scars caused by war. Air Force veteran, Michael Cash is committed to helping these injured veterans fight and win this battle on the home front. The senseless attacks against the United States on September 11, 2001 provoked an unyielding war on terrorism. To protect its people, domestic and foreign, the United States launched Operation Enduring Freedom with the sole mission of eliminating terrorism. Operation Enduring Freedom has resulted in the longest war in this country’s history and is taking an extraordinary toll on military personnel. Since launching Operation Enduring Freedom, our country has deployed over 2.7 million military members to Iraq and Afghanistan to fight the war on terror. Of those 2.7 million deployed, over 400,000 have served at least three tours. After serving this country, many of our military members find themselves fighting a different type of war at home. These military members fight to heal the mental and physical scars this war leaves behind. Of the 2.7 million military members deployed, nearly 1 million suffer from some type of officially recognized service-connected disability. 25% of these service-connected disabilities are considered to have a severity rating of 70 percent or higher. Severity of one’s disability is scaled from 0 to 100 percent, with 100 percent being the most severe cases. The impact from PTSD on these military members is even more staggering. According to the VA, experts estimate that up to 20% of Operation Enduring Freedom veterans have experienced PTSD. Consequently the demand for PTSD treatment continues to grow as the number of diagnosed cases in the military jumped 50% in the past year alone. Overcoming these mental and physical scars alone is nearly impossible for any one person. Many organizations have stepped up to assist our veterans in this fight, but few have successfully helped as many veterans as Operation Family Fund. After serving 30 years in the Air Force, veteran Michael Cash founded Operation Family Fund to assist veterans and their families who have been injured as a part of the Global War on Terrorism. The financial grants provided by Operation Family Fund help these injured veterans transition to their new circumstances and ultimately achieve financial self-sufficiency. Since founding in 2003, Operation Family Fund has provided over $2.5 million in grants to over 2,300 families and veterans. Thanks to the Operation Family Fund, these veterans and their families are able to purchase food, rent, utilities, emergency transportation and vehicle repair, funeral expenses, legal expenses, medical/dental expenses, assistance with a home, rental, lease, purchase or home improvements, assistance with the purchase, rent or lease of a vehicle, trauma training and counseling, caregiver training and support. Having funds to pay for these expenses is critical to helping these injured veterans rebuild a life after their service. The Homes for Heroes Foundation is proud to recognize Operation Family Fund for its service to this nation’s injured veterans. 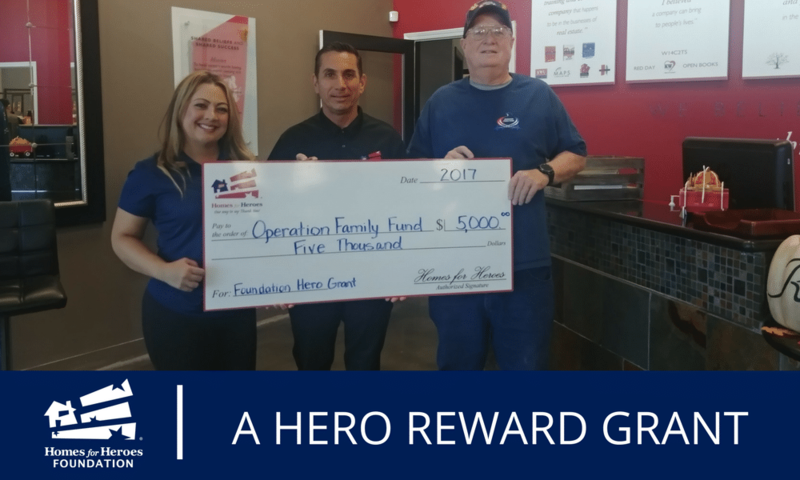 On November 17th, Homes for Heroes Specialists Joy Murphy and Dean Henderson presented Michael Cash and Operation Family Fund with a grant of $5,000 on behalf of the Homes for Heroes Foundation. This grant will be used to further the support of injured veterans. It will also help Operation Family Fund near its 20-year goal of giving back more than $5 million to eligible members and families.